Why do you think the architects chose to build the Amos Rex Museum underground? Do you think it was a good idea? Why or why not? If you could build a museum in your area, what kind of museum would it be? What kinds of things would it contain? 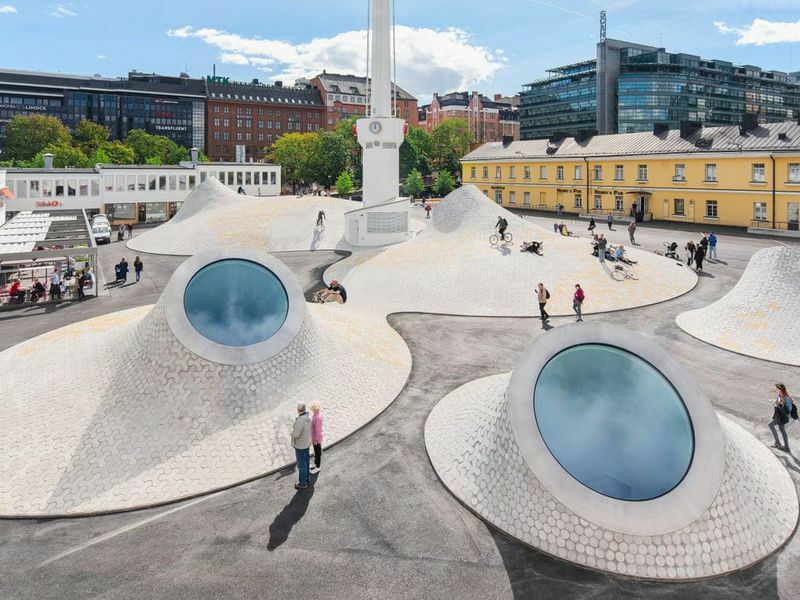 According to the article, the architects wanted to have the square open but draw people to the underground museum. Do you think the domed skylights were a good solution? What other ideas do you think would have worked? In the article, Kai Kartio, head of Amos Rex, says they wanted the museum to be as open as possible because "we have no idea what kind of visual work we are going to be surrounded by in 20 or 30 years' time." What kinds of visual works do you think people will be creating by then? How do you think museums will have to adapt to present these works to the public? Invite students to explore the Amos Rex website. Encourage them to click on each link so they can appreciate the museum's overall design. As a class, discuss the challenges architects faced when creating an underground museum. Then discuss how the museum's design is a good reflection of the type of exhibits it contains. Brainstorm a list of different types of museums. If necessary, offer suggestions such as art, history, science, children's, etc. As a class, in small groups, or with a partner, encourage students to pick the type of museum they would most like to create. Encourage students to brainstorm ideas for their new museum. As they do, instruct them to select a type of architecture that they think is appropriate for their concept. Point out that the design should also contain elements that will draw people in to see their exhibits. As an extra challenge, encourage them to make their buildings eco-friendly. Give students time to draw and/or create a mock-up of their museums. Invite students to present their drawings and/or mock-ups to the class. Encourage them to explain why they think the museum's architecture is a good match for their concept and how their design will draw visitors in to see the exhibits. Challenge classmates to identify eco-friendly aspects in each design. Poll the class to identify the type of museum students would most like to create. Encourage students to offer ideas for the building's design. Then give each student a piece of paper. Invite each student to draw a picture showing what he or she thinks the museum should look like. Have students identify the type of museum they would most like to create. Divide the class into small groups based upon students' selections. If possible, provide examples of different types of architecture for students to study. Then encourage groups to identify the type of architecture they think would be the best fit for the kind of museum they are designing. Challenge groups to come up with a design that includes ideas from each group member. Then give them time to draw a picture of their new museum. Divide the class into pairs. Instruct partners to select the type of museum they would like to create. Encourage them to also think about different types of exhibits their museum might contain. Instruct partners to select an appropriate type of architecture for their new building. Challenge them to include elements that are eco-friendly. Have partners draw a blueprint for their museum's interior design. Then give them time to create a mockup of their building's exterior. Divide the class into pairs. Instruct partners to select the type of museum they would like to create. Encourage them to also brainstorm ideas for two unique exhibits their museum could present. Instruct partners to select an appropriate type of architecture for their new building. Challenge them to include elements that are eco-friendly. Have partners draw a picture of their museum's exterior. Then instruct each partner to create a mock-up for one of the museum's exhibits. This exhibition from the Smithsonian Institution Archives highlights the life of James Smithson and the establishment of the Smithsonian Institution. The site traces the early years of the Institution’s growth and development. It includes images, primary sources and lesson plans. This Smithsonian Institution Archives webpage presents a brief history and historical photo of each of the Smithsonian museums. Be sure to click the link to see the Guide to Smithsonian Architecture! In this lesson from the Smithsonian Center for Learning and Digital Access, students to learn about the history in their community and create a museum of local history in their classroom. In this lesson from the Center for Folklife and Cultural Heritage, students create a museum exhibition that addresses culture and environment in the Rio Grande/Rio Bravo Basin. The materials are adaptable to studies of other cultural-environmental relationships. This activity from the Cooper-Hewitt, Smithsonian Design Museum teaches students the differences and similarities between “masterpieces” and mass-produced objects. Students analyze the value of items and persuade panel members to accept recommended items into their museum collection. In this lesson from the National Museum of American History, students will discuss and brainstorm ideas to discover the destructive impact of environmental factors on man made artifacts and structures. Upon completion of one or more activities, students will gain a concrete understanding of the complexity of the science of preservation. Lavinia Fontana is widely considered the first professional female artist, while Sofonisba Anguissola served as Philip II of Spain’s court painter. Read this Smithsonian magazine article to learn more about them. Worlds apart yet sharing so much, read this Smithsonian magazine article to learn how the two vacation destinations collaborate to bring scholarship and authenticity to Disney audiences.